Attorney General Jeff Sessions told the Alliance Defending Freedom (ADF), an SPLC designated hate group, that they are not a hate group. 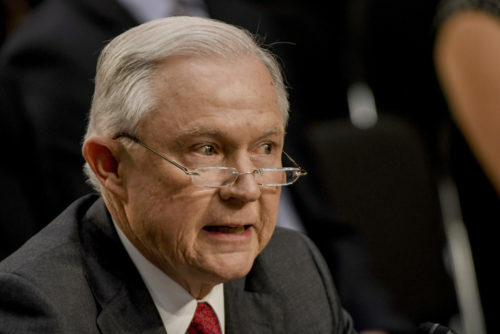 Speaking at the ADF’s Summit on Religious Liberty, Sessions said that he first learned that the ADF was a hate group when he spoke at an event sponsored by the group last year. “We have gotten to the point… where one group can actively target religious groups by labeling them a ‘hate group’ on the basis of their sincerely held religious beliefs,” he said in the speech. The media reported that fact because it is a fact: the SPLC has designated the ADF as a hate group. The ADF has repeatedly said that gay people are pedophiles, called homosexuality “evil,” and said that LGBTQ rights lead to the “sexual exploitation” of children. They want the government to criminalize homosexuality “to protect society at large” and they decry the “homosexual agenda,” a nefarious scheme to destroy Christianity. He also said that he doesn’t believe that the ADF is a hate group. “You and I may not agree on everything — but I wanted to come back here tonight partially because I wanted to say this: You are not a hate group.” He got loud applause for that line. The SPLC has already responded to Sessions’s comments, explaining that a hate group can be motivated by religion, but that doesn’t change whether or not they’re a hate group. “In a manner analogous to how the Department of Justice defines hate crimes, we identify hate groups as those that vilify others because of their race, religion, ethnicity, sexual orientation, gender identity, or disability – prejudices that strike at the heart of our democratic values and fracture society along its most fragile fault lines,” said SPLC President Richard Cohen. As Sessions said, this is not the first time he spoke at the ADF. Last year, he spoke at their Summit on Religious Liberty, where he promised the Trump Administration would advance the hate group’s agenda. Earlier this week, HRC submitted a Freedom of Information Act (FOIA) request to know who is on the Task Force, what its mandate is, and how much its budget is. “The American people deserve transparency about how much taxpayer money the DOJ is spending on this discriminatory so-called ‘task force,'” said HRC’s David Stacy. “Now the SPLC uses their "hate group" label as a weapon and they have wielded it against conservative organizations that refuse to accept their orthodoxy and choose instead to speak their conscience. They use it to bully and intimidate groups like yours which fight for the religious freedom, the civil rights, and the constitutional rights of others.” United States Attorney General Jeff Sessions in this speech to the Alliance Defending Freedom Summit on Religious Liberty.